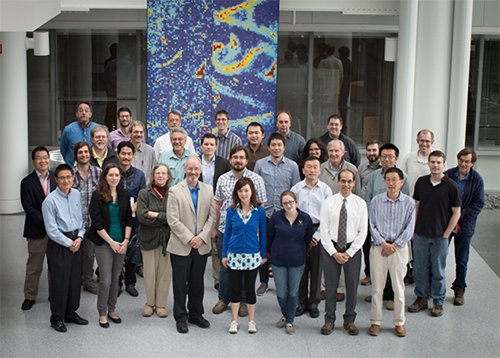 The “nano to meso” workshop was held on June 13th and 14th and involved 12 invited speakers and 28 attendees. 25 remote viewers asked questions and participated in discussions through an on-line YouTube stream. The organizing committee consisted of Ruipeng Li, Detlef Smilgies and Zhongwu Wang (CHESS), helped by outside organizers Ou Chen (Brown University) and Kevin Yager (Brookhaven Center for Functional Materials). This workshop sought to bring together scientists seeking to build and understand new materials achieving exceptional properties through assemblies of either organic or inorganic building blocks or both at all length scales. 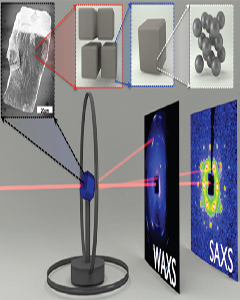 Through mimicking the nature-enabled materials growth, they seek to discover, design and fabricate novel materials by control and assembly of nanocrystals into periodic ordered supercrystals through fine tuning of particle size, shape, composition and modification of surface molecular decoration in lab. Invited speakers and participants were asked to consider CHESS strengths (e.g. faster detector, friendly collaborative environments, etc.) together with expertise and scientific vision, to identify important science applications and major developments of unique technique which falls into one category of materials design and processing from nano to mesoscale. The theme of in-situ processing of functional soft materials was introduced by speakers Kevin Yager (BNL) and Joshua Choi (UVa), who discussed photo-thermal assembly of block copolymers and self-assembly of metal halide perovskite thin films, respectively. Future high-performance applications will require sophisticated functional soft materials, including conjugated molecules and polymers, nanoparticle composites, and block copolymers. With the ability to self-assemble, these materials have direct functionality — chemical, electronic, optical, or magnetic — relevant to areas of organic electronics (OLED, OFET, OPV) and nanotechnology (e.g. directed self-assembly, ultrafiltration and desalination membranes). Many industrial processing methods can be studied in-situ with x-ray scattering to help understand and fine-tune the quality of the devices, including thermal annealing, solvent vapor annealing, blade coating and laser annealing. A second theme revolved around in-situ discovery and processing of designer materials. Speakers Ou Chen (Brown) and Yugang Sun (Temple) introduced self-assembly of multicomponent nanocrystal building blocks. Recent advance of wet synthetic chemistry enable exquisite control of nanocrystals (NCs) not only with great monodispersity, size, shape and composition, but also with desired molecular decorations on NC surfaces. As it is increasingly clear, these tunable and fully-customizable NCs building blocks can act as “super-atoms” having ability to form either random or periodically ordered superlattices. Examples given included using DNA-mediated Au supercrystal to mimick bio-inspired structures, or using magnetic/luminescence to image and sense biological cell activities in a controlled way. Also mentioned were using in-situ processing with pressure, temperature or solvent extraction to develop mechanically stable architectures with size-dependent and collective properties for device purpose, such as creating solar cells by printing 3D porous nanostructured catalysts or 2D semiconductor nanowire arrays. Some of the participants at Workshop 4 in the Physical Sciences Building.